Togakushi Shrine Okusya (戸隠神社・奥社) is the upper shrine of all Togakushi Shrine. It is also the first shrine built in Togakushi. It was originally built as Shugen-do Temple in 849. Today, it is known as one of the strong power-spot in Japan, and many people worship this shrine to gain the spiritual power of nature. 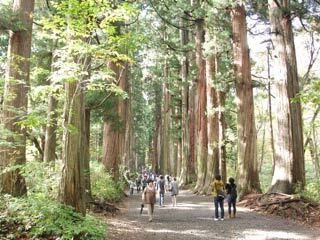 The cedar avenue of Okusya is very beautiful. There is also Kuzuryu Shrine right next to Okusya. About 2km Sando Street from the parking to the shrine and there is hard stairs. Restrooms are located on the Sando. Today, it is very crowded especially on the weekend. It takes more than one hour to worship at this shrine. 2. use shuttle bus (only available on weekend) to Okusya. Kuzuryu Shrine enshrines: Local god. It is older than Okusya. The cedar avenue was planted in 1612. The legend said, when Tajikaraonomikoto threw the Amano iwato, the rock of the sky to hide Amaterasu, the rock flied all the way to Mt. Togakushi. The name of Togakushi was named after this story. Therefore, all of the gods enshrines in Togakushi are related with this story. It was founded as Sugen-do temple. It was one of the famous sacred spots in Heian Period and many practitioners of Shugen-do visited this temple. In Meiji period, it was separated and became shrine.